You voted! - Our favorite places we've been to. Nick here. Hi. Hey. Hello. How are you? Ok. Great. First off, much love & thanks to everyone who has been following & checking out our blog. It's been a lot of fun so far & we've got some awesome plans in the works for Two Small Fries! 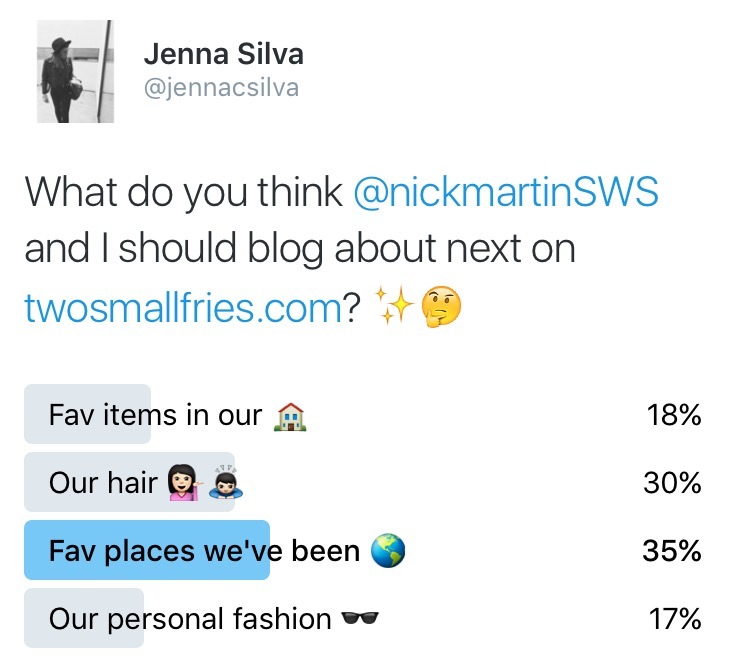 So, the other day, Jenna posted a Twitter poll asking you guys about what we should blog about next. Unanimous vote concluded on the topic of what our favorite places we've been to are.. which come to find out, wasn't as easy to answer as we anticipated. Jenna & I have been very fortunate to visit a lot of awesome places so far since we've been together. But, if there's one place that truly sticks out as one of our all-time favorites, it would be our vacation to Zihuatanejo, Mexico! Early on in our relationship, we both established the mutual connection & desire to travel a lot. Obviously with being a musician, almost half of my life has been on the road, traveling the world. It's a give-in. But one thing I hadn't really experienced a whole lot of is a tropical-type vacation -- or really, any sort of vacation involving relaxation. I knew I wanted to experience that with Jenna and I knew I wanted to fly down south to Mexico to do it up. One night while we were home, we went to get some Mexican food for dinner at a little hole-in-the-wall. When we got back in the car, I surprised Jenna with the news that I booked us a trip to Zihuatanejo (which I did not know how to pronounce, but Jenna quickly corrected me, knowing exactly where I was talking about.. err, trying to talk about), and quickly tears were shed in happiness. Cheesy? Yeah. Sorry not sorry. Fast forward a few weeks later, we were on our way, to what would turn out to be, one of the most gorgeous places I've ever been to -- which is why we chose this destination as being our favorite place we have ever been to (so far). It was a really memorable & beautiful week spent together. We had only been together about 6 months at this point, but the realization was very much there that I was going to spend the rest of my life with Jenna. Maybe that's part of the reason that this trip, specifically, meant so much to me -- the both of us. Of course the beaches, the food, the drinks, and the overall experience is one in a million.. But, it really means so much more when it's spent with someone you truly love & want to spend every waking moment with. Cheesy? Yeah. Sorry not sorry. Again. We spent 6 days there. We only left the resort once to go on a sunset boat cruise up the coast to Acapulco. It was fun watching the older folks getting so rowdy on tequila poppers -- when a guy with a bottle of tequila pours a shot down your throat and violently shakes your head. And no, we did not partake in that. Tequila + head shaking + boat movement = no, thank you. We did go swimming in the ocean one of the days, which did not end well with a huge wave subsequently slamming our bodies to the ocean floor, resulting in Jenna losing her sunglasses & my shoulder popping out of the socket. We can laugh about it now, but it was not as funny when it happened, at the time. We ate every meal on the beach, hung out at the pool, and just enjoyed each others company with minimal technology for the week. Highly recommended even if you're not on vacation. Put your cell phone down for a bit & enjoy your environment -- unless you're reading our blog, it's TOTALLY cool. Well, that concludes this blog post. Hopefully I didn't ramble too much for ya. If you give me a forum like this to babble on & on, this is what you get. Sorry not sorry. Yup. Once more. If you've made it this far in the blog post, I'd like to give you the inside scoop that I will be posting blogs while I'm out on Warped Tour. What would you like to see posts about, specifically? What I do in the mornings while Warped Tour is being built, what I do before the set, what bands I watch on a certain day.. you tell me. Two Small (Spicy) Fries celebrate Cinco de Mayo!